One of the challenges I’ve faced with writing over the years is understanding who it is I’m actually writing for. Is it for me, or is it for an audience? If it’s for an audience, what type of audience is it? Is it other writers, or travellers, or seekers of relationship advice, or partners of passive aggressive men, or technology enthusiasts, or introverts, or….? I could go on and on. Over the years I’ve pondered this question a lot, and out of all the different topics I’ve written about, I’ve always wondered which audience I’m writing for. I write about topics that interest me, but occasionally I’ve thought that maybe I should focus on a single topic, and write for the audience of that topic. But when I’ve tried that, it’s ended up failing miserably. It seems that focusing on a single topic isn’t what my heart and soul wants to do. It wants to be free to write about anything and everything. I’ve worked out that I’m writing for myself, and naturally I like the idea that maybe there’ll be some readers who will enjoy what I write too, and maybe they’ll hang around to read some other stuff I write. But ultimately, it’s not them I’m writing for, it’s myself. I have opinions I need to share, and observations I need to make, and emotions and thoughts and experiences I need to explore. These are what I love writing about, and so my Alan’s Journey blog is all about me, and my writing is for myself, and I’ve come to understand that’s great for me. But if you’re a writer too, do you know who you’re writing for? Are you focused on a single topic, and so your audience is clearly defined? Or are you struggling to find a topic, so you’re drifting around trying to find a topic you can call home? Maybe you’re like me, and you know you just love to write about multiple topics. You could of course dedicate those topics to specialised blogs and run multiple blogs at the same time, or you can think (like me) that’s a huge waste of time and you actually prefer to just meander around exploring different topics on a single blog. Whatever you prefer to write about, whether it’s a single topic or multiple topics, I recommend you write for yourself first. You’re the one who’s going to have to love it. You’re the one who’s going to have to wake up every day with thoughts on your mind about what you want to write about today. You have to be able to put your heart and soul into it for it to have any meaning to you, and then to those who read it. Write for you. 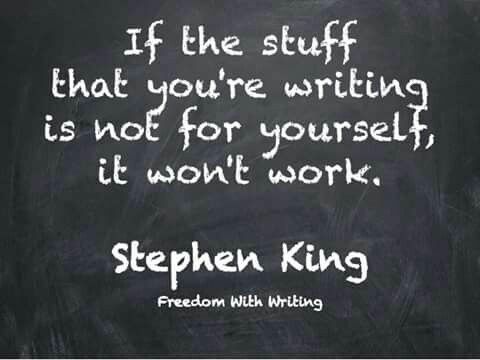 You’re all that’s important when it comes to your writing. By all means improve upon your work with your own experience, insights and feedback, but don’t make other people the priority with your writing, because then you’re just going to end up bored and hating it.